By Sadiq Umar – The Director-General of the Industrial Training Fund (ITF), Joseph Ari, says the fund has trained over 150,000 Nigerians in the last two years in accordance with its reviewed vision. Mr. Ari said ITF’s six-year plan tagged “ITF Reviewed Vision: Strategies for Mandate Actualization” which was the initiative introduced under his leadership has helped the fund to expand existing skills acquisition programmes and introduce new initiatives. Speaking at a media briefing in Abuja, Tuesday, the Director General said the fund will train 13,000 Nigerians on 11 vocational skills in order to achieve the Federal Government’s policy on job and wealth creation. According to him, numerous vacancies still exist in several sectors of the economy that cannot be filled by Nigerians due to the absence of requisite skills. “In order to address the issue of unemployment and drive President Muhammadu Buhari’s job creation drive, ITF management came up with a list of implementable programmes for 2018. “The programmes are the National Industrial Skills Development Programme (NISDP), Women Skills Empowerment Programme (WOSEP), Air-Conditioning and Refrigeration (Training on Wheels), Designing and Garment Making, and Skill Training and Empowement Programme for the Physical Challenged (STEP-C). 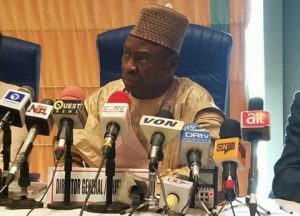 “Others are Post-Harvest Techniques and Project Development, Aqua-culture/Fish Farming, Manure Production, Crop Production/Greenhouse Technology, Poultry Farming and Training Programme Development on international Marketing,’’ he said. Ari said the training programmes would last for a period of five months, adding that the 13,000 Nigerians that would be trained was like a drop of water in the ocean and called on state governments and other stakeholders to sponsor additional trainees. He said such stakeholders would be required to cover the monthly stipends of the trainees, as well as provide start-up packs for such additional trainees. According to him, they will also offset any allowances for the master-craftsmen that will be retained as a result of the additional trainees. Ari said that tackling unemployment through skills acquisition cannot and should not be the responsibility of the ITF and other Federal Government agencies alone. He said the gesture to train Nigerians was informed by the growing realisation that accelerated skills acquisition was the only way to stem unemployment, especially among youths. According to him, governments all over the world have turned to skills acquisition, which is the universal currency of the 21st century to arm their citizenry with skills for employment and growth. He called on the media to educate members of the public in order to disabuse their minds that skills acquisition were not for never-do wells, the poor and the wretched in the society. Ari said as part of ITF mandate, the fund had trained 92 personnel of the Nigerian Air Force (NAF) on various vocational skills. According to him, the training will enable the personnel to improve on their job, which will in turn lead to a multiplier effect as other people learn from them. He said that the plan commenced in 2016 and would terminate in 2022, adding that the key objectives were to accelerate the impartation of technical vocational skills to Nigerians. Ari said about two years into the implementation, ITF trained more than 150,000 Nigerians on various trades and crafts. He said that the beneficiaries were earning sustainable livelihoods either as paid workers or as entrepreneurs employing others.